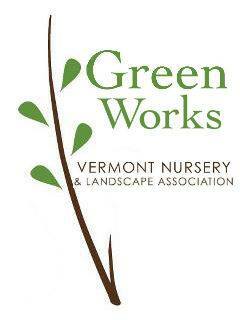 new hampshire landscape designers Archives | Zachary Berger Associates, Ltd.
Last Friday, as new members of Green Works – Vermont Nursery & Landscape Association, I attended the association’s winter meeting at the Sheraton Hotel in Burlington. While Zach was tending to New Hampshire clients, I hit the show alone, as a fresh face on the Vermont design scene. Upon arrival, the halls that lead toward the main ballroom were lined with a variety of presenters from across the industry. Although attending alone created some mild anxiety, a few conversations with vendors prior to the keynote address was just what I needed to get comfortable. I was mostly happy that most of the representatives had heard of us. A lack of time before the keynote address left me with limited face time with vendors, so I quickly headed into the ballroom. It wasn’t long before I spotted our newly acquainted salesman Eric Mootz from Trowel Trades and took a seat with their sales team. Soon after introductions and light conversation, Claudia West took the stage. Claudia is the current ecological sales manager at North Creek Nurseries and has just released her new book, “Planting in a Post-Wild World”. Her presentation entitled, “Plants that Stand the Test of Time” directed the audience’s focus toward discussing the lack of understanding and general oversell of plant communities. Then, she established levels of communities and how to integrate those into your design intentions. Overall, she knocked it out of the park, ending the talk with a Q and A session, which she handled with grace. If there’s one tough crowd for complete agreement on any particular subject, it’s the landscape and nursery crowd. Post Q and A, I took advantage of more face time with vendors, visiting with Ideal and Van Berkum Nurseries. Ideal was familiar with our brand and as helpful to provide up to date literature of their products. Ideal is a leading manufacturer of concrete pavers, landscape retaining walls, and other garden products. Their lifetime warranty is a very nice feature. Leslie Van Berkum happened to remember my face from last year’s New England Grows conference and was happy to take some time to talk about the upcoming season. 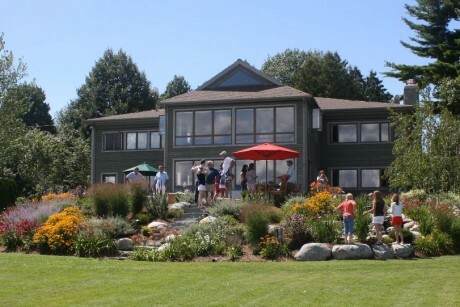 In our opinion, Van Berkum has the nicest selections of landscape perennials you’ll find just about anywhere. In no time at all, it was on to the awards ceremony. Each year, Green Works awards several professionals across the industry and ending it with designers presenting their awarded projects. Perhaps a bit anti-climactic, as all winners had already been published, it was still very pleasant to see fellow professionals’ hard work being acknowledged. If there was a main theme that played throughout the awards ceremony, it was the very clear fact that Green Works is a tight-knit community made up of hard working professionals, as tears, hugs, and general respect for one another’s work filled the room. Post-awards lent time for a few minutes for electing officers and discussing general business at Green Works before adjourning for lunch. As I wrapped up notes, I was approached by our Green Works sponsors, Mike and Carol MacLeod of Evergreen Gardens in Waterbury Center. Green Works requires new members to have a sponsor in their inaugural year of membership and Mike and Carol were happy to help. If you haven’t h ad the chance to stop by Evergreen lately, we recommend you give them a look. The lunch line was quite long, but small talk with design award recipient, Caroline Dudek of Landshapes moved things along nicely. The buffet did not disappoint….can you say BUILD YOUR OWN TACO BAR!!! Growing up in South Texas, I have a bit of a soft spot for tacos. I can’t say that I’m really that picky about them either, just happy to have them. After all, it was unlimited tacos. With full bellies, we joined for award recipient presentations. Seeing how others present their work can be a real treat and not one presentation is even close to being the same. My personal favorite was the work of Andrew Newton and Mike Vonnostrand of diStefano Landscaping. Let’s just say there’s a special place in my heart for natural stone and plant designs that consider the current landscape setting. I do wish they had presented their work, rather than have a fellow colleague present. Perhaps they do not possess an ounce of egotism and narcissism that so readily plagues the design industry. Yeah, we’ll go with that-they’re humble. My time at Green Works was wrapped up by a discussion from Bruce Fraedrich, from Bartlett Tree Experts. Bruce stuck to the science of soil testing in Vermont and tied in topics of organic gardening, invasive species, and landscape management. One question he asked that surprisingly seemed to stump the room was directed at whether the planting of natives is the answer to our invasive problem. He answered this question by saying that this is not yet known whether natives will cure pest problems and that this idea is currently being evaluated. I thought that was a pretty bold move considering the composition of the room and likely presence of native plant purists. Thanks again to Mike and Carol MacLeod at Evergreen Gardens for their sponsorship. 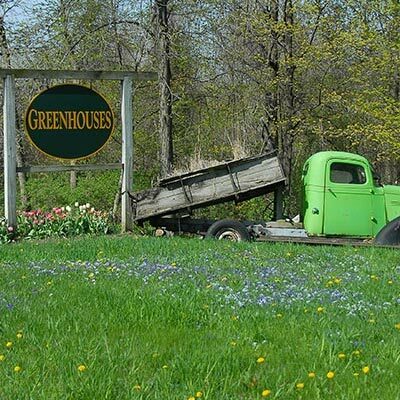 We look forward to many meetings in the future with our new friends at Green Works – Vermont Nursery and Landscape Association. 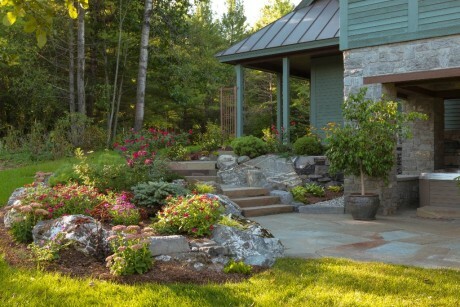 Author RonnyPosted on February 20, 2016 October 25, 2017 Categories BlogTags best landscape designers new hampshire, best landscape designers stowe vermont, best landscape designers vermont, green works vermont, naturalistic landscapes, new hampshire landscape designers, nh landscape architecture, nh landscape design, organic landscape designers, organic landscapes, vermont designers, vermont landscape architects, vermont landscape association, vermont landscape designers, vt landscape designersLeave a comment on Hello Vermont Horticulture!